Welcome to Milan! At 6 pm, meet your Tour Director and traveling companions and leave the hotel for a welcome dinner at one of Milan’s fine restaurants. This morning, enjoy a walking tour with a Local Guide. Start with a visit to the SFORZESCO CASTLE GROUNDS and MUSEUM. Then, enter DUOMO SQUARE with its magnificent gothic cathedral, the glass-domed GALLERIA, and admire the famous La Scala Opera House. Optional excursions are available to make the most of your stay. Arrive in Turin, capital of Piedmont, once capital of Italy, and birthplace of the Fiat automobile. During your sightseeing with a Local Guide, admire the amazing 548-foot-high Mole Antonelliana, symbol of Turin, and walk through the historic center to visit the CATHEDRAL that houses the Holy Shroud. Drive into the fertile Po area to Parma, famous for its prosciutto and Parmesan cheese. Your guided sightseeing will focus on the Romanesque cathedral, the bell tower, and the octagonal baptistry, made of pink Verona marble. This evening, you may wish to join an optional dinner excursion to try out local specialties. 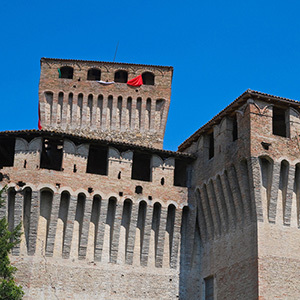 Stop in Modena and spend time in its historic center, and admire the City Hall, Cathedral, and Ghirlandina Tower. You will also be treated to a BALSAMIC VINEGAR TASTING. Learn all about this typical Italian product, and enjoy a light lunch before continuing to Venice, a powerful magnet for romantics and art lovers from around the globe. 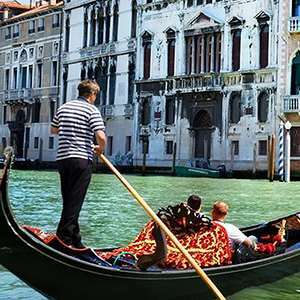 This evening, an optional excursion is available to experience a Venetian night out. Take a PRIVATE BOAT to join your Local Guide for a walking tour. 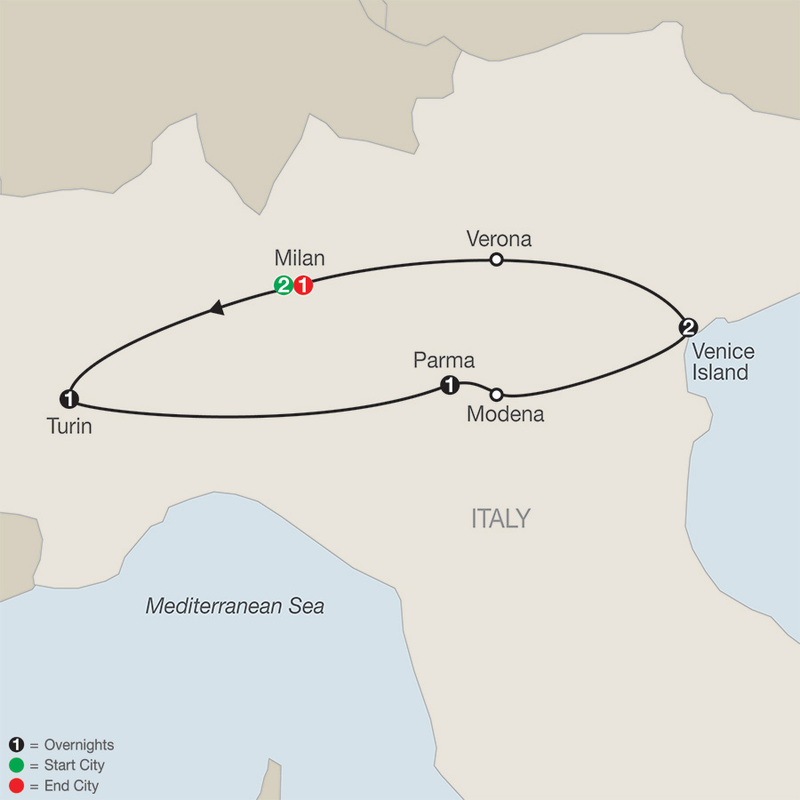 Highlights are ST. MARK’S SQUARE with its byzantine BASILICA, lavish DOGES’ PALACE, and the famous BRIDGE OF SIGHS. Also, watch a skilled GLASSBLOWER fashion delicate objects in an age-old traditional manner. To enhance your stay, why not join an optional excursion? In Verona, the medieval setting of Shakespeare’s Romeo and Juliet, take pictures of Juliet’s balcony and rub her statue’s bronze breast for good luck. Next, marvel at the Arena, an incredibly well-preserved pink marble Roman amphitheater, where gladiators once fought. Built in the 1st century AD, it is now the magical venue for world-famous opera performances. Return to Milan, where a farewell dinner at a local restaurant awaits to celebrate the success of your Northern Italy Escape. Enjoy a cruise around shimmering Lake Como for an encounter with its charming villages, peaceful bays, and elegant villas owned by the world's rich and famous!